This article is part of IPS coverage of the 16 Days of Activism Against Gender Violence, which began on Nov. 25, the International Day for the Elimination of Violence against Women. 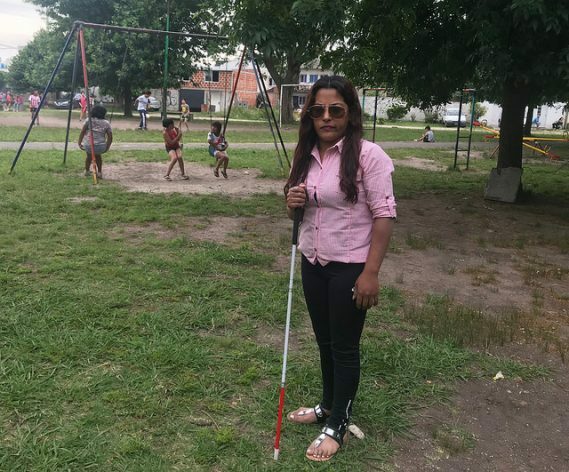 LA PLATA, Argentina, Dec 1 2018 (IPS) - Left blind by a beating from her ex-husband, Susana Gómez barely managed to avoid joining the list of nearly 2,800 femicides committed annually in Latin America, but her case shows why public policies and laws are far from curtailing gender-based violence in the region. “I filed many legal complaints (13 in criminal courts and five in civil courts) and the justice system never paid any attention to me,” Gómez told IPS in an interview in a square in her neighborhood in Lisandro Olmos, a suburb of La Plata, capital of the province of Buenos Aires. Although they already existed in Argentina in 2011, when the brutal attack against her took place, the specialised women’s police stations were not enough to protect her from her attacker. Her life was saved by La Casa María Pueblo, a non-governmental organisation that, like others in Latin America, uses its own resources to make up for the shortcomings of the state in order to protect and provide legal advice to the victims of domestic violence. Gómez, her four children and her mother, who were also threatened by her ex-husband, were given shelter by the NGO. “We had nothing. We went there with the clothes on our back and our identity documents and nothing else because we were going here and there and everyone closed the door on us: The police didn’t do anything, nor did the prosecutor’s office,” said Gómez, who is now 34 years old. “Without organisations like this one I wouldn’t be here to tell the tale, the case wouldn’t have made it to trial. Without legal backing, a shelter where you can hide, psychological treatment, I couldn’t have faced this, because it’s not easy,” she said. In April 2014, a court in La Plata sentenced her ex-husband, Carlos Goncharuk, to eight years in prison. Gómez is now suing the government of the province of Buenos Aires for reparations. “No one is going to give me my eyesight back, but I want the justice system, the State to be more aware, to prevent a before and an after,” said Gómez, who once again is worried because her ex will be released next year. Lawyer Darío Witt, the founder of the NGO, said Gómez was not left blind by an accident or illness but by the repeated beatings at the hands of her then-husband. The last time, he banged her head against the kitchen wall. “The aim of the reparations is not simply economic. What we want to try to show in the case of Susana and other victims is that the State, that the authorities in general, whether provincial, municipal or national and in different countries, have a high level of responsibility in this. The state is not innocent in these questions,” Witt told IPS. “When I went blind and realised that I would no longer see my children, I said ‘enough’,” Gómez said. According to the Gender Equality Observatory (OIG) of the Economic Commission for Latin America and the Caribbean (ECLAC), at least 2,795 women were murdered in 2017 for gender-based reasons in 23 countries in the region, crimes classified in several countries as femicides. 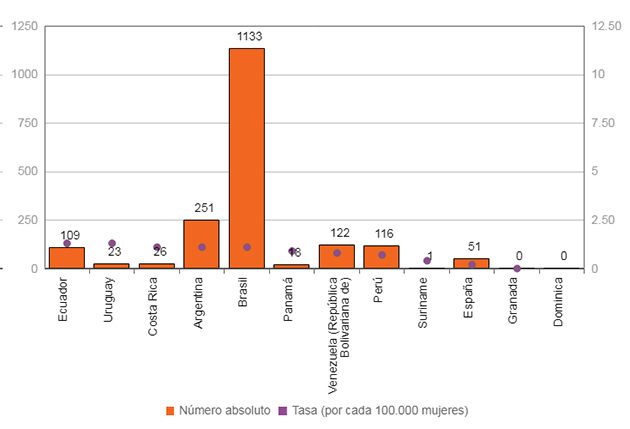 The list of femicides released this month by OIG is led by Brazil (1,133 victims registered in 2017), in absolute figures, but in relative terms, the rate of gender crimes per 100,000 women, El Salvador reaches a level unparalleled in the region, with 10.2 femicides per 100,000 women. 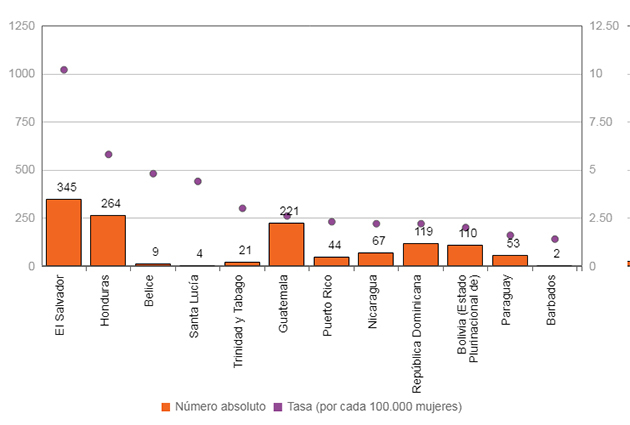 Honduras (in 2016) recorded 5.8 femicides per 100,000 women, and Guatemala, the Dominican Republic and Bolivia also recorded high rates in 2017, equal to or greater than two cases per 100,000 women. The OIG details that gender-based killings account for the majority of murders of women in the region, where femicides are mainly committed by partners or ex-partners of the victim, with the exception of El Salvador and Honduras. “Femicides are the most extreme expression of violence against women. Neither the classification of the crime nor its statistical visibility have been sufficient to eradicate this scourge that alarms and horrifies us every day,” said ECLAC Executive Secretary Alicia Bárcena as she released the new OIG figures. Ana Silvia Monzón, a Guatemalan sociologist with the Gender and Feminism Studies Programme at the Latin American Faculty of Social Sciences (Flacso), pointed out that her country has had a Law against Femicide and other Forms of Violence against Women since 2008 and a year later a Law against Sexual Violence, Exploitation and Trafficking in Persons. “Both are important instruments because they help make visible a serious problem in Guatemala, and they are a tool for victims to begin the path to justice,” she told IPS from Guatemala City. However, despite these laws that provided for the creation of a model of comprehensive care for victims and specialised courts, “the necessary resources are not allocated to institutions, agencies and programmes that should promote such prevention, much less specialised care for victims who report the violence,” she said. In addition, “prejudices and biased gender practices persist among those who enforce the law” and “little has been done to introduce educational content or programmes that contribute to changing the social imaginary that assumes violence against women as normal,” and especially against indigenous women, she said. In the region, “significant progress has been made, which is the expression of a women’s movement that has managed to draw attention to gender-based violence as a social problem, but not enough progress has been made,” Monzón said. According to U.N. Women, a total of 18 Latin American and Caribbean nations have modified their laws to punish sexist crimes against women such as femicide or gender-based aggravated homicide. But as Gómez and other social activists in her neighborhood conclude, much more must be done. The meeting with the victim took place on Nov. 25, during an informal social gathering in the Juan Manuel de Rosas square, organized by the group Nuevo Encuentro. “In more narrow-minded places like this neighbourhood, it seems like gender violence is something people are ashamed of talking about, the women feel guilty. Making the problem visible is part of thinking about what tools the State can provide,” she told IPS. 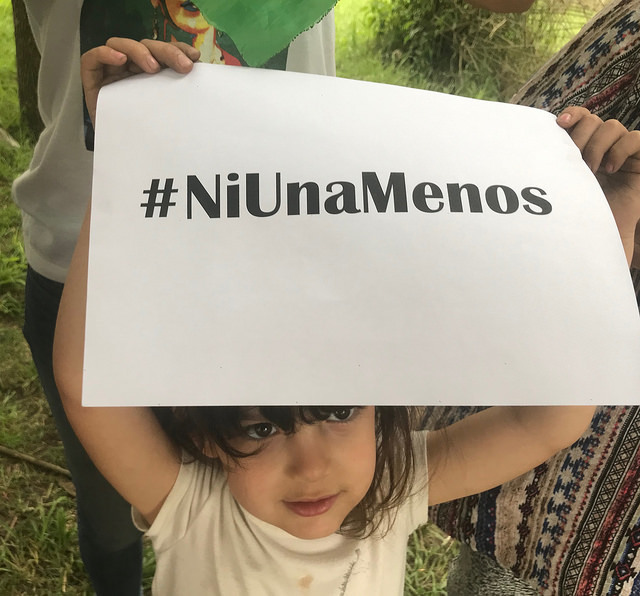 “Or to see what those tools are,” said Olivia, her five-year-old daughter who was playing nearby, and who proudly held a sign that read: “Ni Una Menos,” (Not One Woman Less) the slogan that has brought Latin American women together, as well as #NiUnaMás (Not One More Woman). She exemplifies a new generation of Latin American girls who, thanks to massive mobilisations and growing social awareness, are beginning to speak out early and promote cultural change. “Today women are becoming aware, starting during the dating stage, of the signs of a violent man. He doesn’t like your friends, he doesn’t like the way you dress. Now there’s more information available, and that’s important,” said Gómez, who is a volunteer on a hot-line for victims of violence. “Now they call you, they ask you for advice, and that’s good. In the past, who could you call? Besides the fear, if they promise to conceal your identity, that prompts you to say: I’m going to file a complaint and I have a group of people who are going to help me,” said the survivor of domestic abuse.